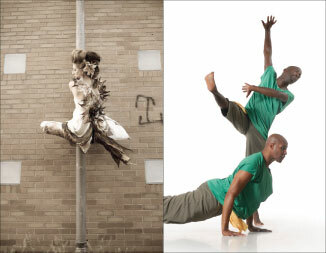 DanceWorks is a DOUBLE BILL this week! Double-Edge Dance will showcase Etched in Motion, choreographic intrigues teetering on the brink of emotional breakdowns or breakthroughs. Radella, in close collaboration with co-founder and composer Ross Feller, choreographed the Double-Edge works. Samantha Beckerman, Shaina Cantino, Matt Davis and Radella will premiere four pieces. Matthew Thornton, former member and current guest teacher for the Pilobolus Dance Theatre will perform Laden in collaboration with textile artist Rebecca Cross. The Beginning is a collection of existing and new solos and duets by local and national choreographers performed by the Greene/Medcalf Movement Project. The vision for this project is to create, commission and perform new and thought-provoking contemporary solos and duets that aim to push the boundaries of dance. Longtime friends and former classmates at Cleveland’s School of the Arts, this duo joined forces to in 2010 to create a duet for their high school reunion and subsequently launched the project. In addition to Medcalf and Greene, choreographers on the program include Lisa K. Lock and Troy McCarty. This entry was posted in cleveland, dance, ohio, shows, theatre and tagged art news, cleveland, cleveland public theatre, CPT, dance, dance works, danceworks, ohio, show, theater, theatre. Bookmark the permalink.